Available April 1, 2019. Looking for an ideal 'home away from home'? This large, luxurious and convenient efficiency on a quiet block in the city's most fashionable neighborhood is just the place for you! Located between Dupont and Logan Circles, in an 1880s rowhouse, the efficiency gets a 98% walkability score from WalkScore. Within two blocks, you'll find Whole Foods Market, CVS pharmacy, Logan Hardware, drycleaners, banks, churches, clothing stores, convenience stores, liquor stores, yoga and fitness studios, and more restaurants, cafes and coffee shops than you can count. On the cultural scene, the Studio Theater, Source Theater, Lincoln Theater, and Landmark's Atlantic Plumbing Cinema are close by, as well as the Jewish Community Center, which offers a wide variety of films and arts programs to the public. Here in the arts district, there is also a wide variety of private galleries and jazz clubs, and a thriving nightlife. You can walk to the White House, the World Bank, International Monetary Fund, and K Street, or hop on Metro at one of three stations within a 15-minute walk. Cyclists can enjoy dedicated bike lanes in every direction, and take advantage of a Capital Bikeshare rental location around the block. There is frequent bus service to get you anywhere in the city, and taxis and Zipcars are readily available. When you're not out and about, a tranquil retreat awaits. From a lovely gated garden, enter your own private door into a brick foyer with a desk and printer for your computer, with free wireless broadband access, and walk-in closet. From there, head into the great room with decorative fireplace and antique wood mantel, dining table for four, 37' flat-screen TV with premium cable, DVR, and DVD player. Facing the decorative fireplace (or we can move it into the lovely bay window area) a top-of-the-line queen-sized sleep sofa featuring the highest-quality memory foam mattress. The sleep on this bed is phenomenal!. Also, an iPhone/iPod-compatible stereo. You'll have all the storage you need with a 5-drawer dresser and a Victorian armoire. The floors are stained and polished concrete, with oriental rugs. Your sleek, modern bathroom has a combination bathtub/shower and a large vanity with granite top and a marble tile floor. Next to the bathroom, you'll find a utility closet with full-size stacking washer and dryer. Last but not least, head to the separate kitchen with sparkling white cabinets, granite countertops, and all the amenities: Bosch dishwasher, microwave, toaster oven, coffee maker, Vita-Mix blender, and all the tools for the serious chef. We provide complimentary cleaning services on a biweekly basis. You can control your own heat, air-conditioning, and security system from a digital keypad; and all utilities are included. Preference is given to longer-term stays, with a minimum of 3 months. No smoking anywhere on the property. No pets. Keywords: Dupont Circle, Logan Circle, U Street, luxury, furnished, efficiency, metro, downtown, World Bank, gay-friendly, long-term rental. english, russian, A smathering of French. Perfectly awful Italian. The owners are long-time residents of the District of Columbia. They have carefully restored this 1880s rowhouse to its original grandeur. We purchased this property because it features the proper mix of fine 19th century homes in a 21st century environment. Quiet streets, yet steps to the main stream of activities and the arts! In the very heart of the city, this wonderful neighborhood has become the hub of social activity, fine dining, theater, and excitement. Be assured, you'll be living in an area of the city that is considered a destination. Fantastic convenience, very friendly neighborhood. Tub. Shower. Vanity with granite top. Vanity has abundant storage. Marble floor. In the heart of DC's hottest neighborhood. Steps from restaurants, bars, Whole Foods, CVS, banks, wine stores, transportation. Premium XFinity Channels (e.g., HBO, Cinemax, Showtime) and DVR. For five months I had the pleasure of staying in this apartment and was so sad to leave! The owners are perfectly lovely and could not have been more welcoming and accommodating. They've thought of everything you could need in this beautifully furnished home, and you absolutely will not find better landlords or a better location in DC. I walked everywhere I needed to go for work, grocery and other shopping, countless restaurants, theatres, parks, museums, etc., or hopped on the Metro since Dupont, McPherson and U Street Stations are minutes away. It was liberating not needing to have a car. The street is very quiet and safe, the apartment so meticulously maintained and designed for comfort that I really looked forward to coming home at the end of the day. I echo all the positive remarks in the other reviews and if I could I'd give this 6 stars because the total experience (exceptional owners, beautiful apartment, ideal location) puts this in a class all by itself. Fantastic apartment right in the heart of everything you need in D.C. I spent 3 months in this apartment after moving into D.C., and I couldn't have asked for a better landlord/tenant relationship, apartment, or location. It's an extremely clean apartment as the landlords have cleaners come every two weeks, which is very nice. Inside the apartment you have everything you need, including a fully stocked kitchen that I loved to cook in. The location of the apartment is steps to the 14th Street strip of restaurants and bars, a block to Whole Foods, a few blocks' walk to Dupont Circle, and a few blocks' walk to the U St. nightlife. I never heard much road noise, as it's on one of the streets perpendicular to 14th Street. All in all, I'd recommend this apartment to anyone looking for a spot in D.C.. It's hard to find something that fills the entire checklist when apartment hunting, and this unit does just that! My boyfriend and I spent 5 months in the apartment and consider ourselves very lucky. We had lived in 2 other places in DC and they don't even compare. We only gave up the apartment because we moved out of the city. The location is the best around. There's something crazy like 900 restaurants within a 4 block radius (don't quote me on the numbers -- just a lot! ), not to mention a Whole Foods, my favorite yoga studio and a gelato shop a block away. I worked in Foggy Bottom and was able to walk or use Capital Bikeshare to get there every day. 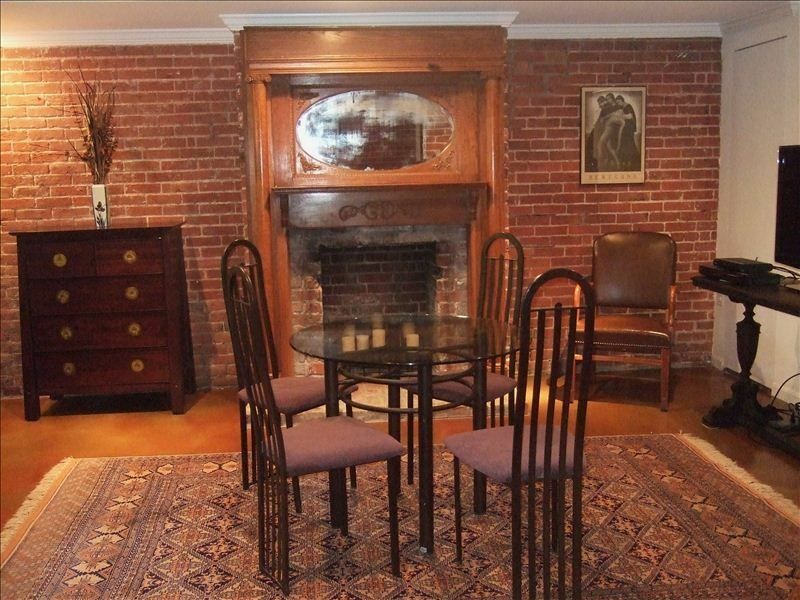 I could go on and on about the location, how beautiful the apartment was (exposed brick walls!) and how great the amenities were (in-unit washer and dryer - unheard of in DC), but the real highlight was Allen and Diana, the owners. They were beyond kind, stocking the apartment with essentials and a few treats before arrival, sending a cleaner in every 2 weeks, the works. They were also responsive and took pride in the apartment - the appliances and amenities were top notch and they were devoted to continuous improvement: while I was there, they did things like re-tiling the kitchen backdrop (always making sure it was while I was at work so I wouldn't be disturbed). Overall, A++. You won't find a better place in DC. Great location, amazing apartment, even better landlords! My girlfriend and I stayed here for 4 months and had an incredible time. The location is amazing! Within minutes to trendy shops/restaurants, grocery stores, Red Line metro and parks. The landlords are some of the greatest people we have ever met and really went out of their way to look out for us and make sure that our stay was more than comfortable. I can't say enough good things about this apartment and the owners! I will definitely look in to renting this place again whenever I stay in the DC area! Excellent Location. Living here makes DC totally accessible. Great accommodation! This location is perfect for those who are coming to Washington DC temporarily and need a safe convenient location with close proximity to buses and metro trains. My work took me to both the Brookings Institution, Carnegie Endowment for International Peace, and The Ronald Reagan Building downtown. All of these locations are within walking distance or a very short metro ride away. Dupont Circle Station to catch the redline to Metro Center is an approximate ten to fifteen minute leisurely walk away. The neighborhood is also great. The apartment is between Logan and Dupont Circles, near U Street corridor and the bustling revitalized 14th street restaurant district. I was never ever in in need of entertainment or shopping (a Whole Foods is right around the corner and a Safeway is a few blocks away). The listing description and the photos are spot on accurate. The accommodations are extremely clean and well maintained. Safety was paramount in choosing a location in DC and this place has it. There is a security system as well as gated access to the apartment. One should never need to feel scared here. The kitchen is wonderful to cook in, the bathroom is large with great space, and the living/sleeping area is a great size for relaxing after a hard day of either leisure or work. The walk in closet is a wonderful storage area for clothing as well as other necessities. The desk and chair provided is also excellent for working from "home". Internet is fast and the cable options are endless. Do not hesitate in staying here. The owner is one of the nicest people I've met in Washington and is always willing to help with recommendations of restaurants, things to do, and daily DC life tips to make your stay easier. The owner is always easy to get ahold of and never intrusive into your stay (the best of both worlds). For short term stays lasting several months look no further. I thoroughly recommend this property. This is a lovely place to stay. Q Street is central to almost anything you could want to do. This is a safe area and I felt fine walking around. A ton of attention to detail went into renovating this place for guests. I'm in love with the kitchen as you can cook a first class meal. I spoke with Allen for all dealings and he's great to deal with. He and his wife put in a ton of time to restoring the townhouse and it shows. NOTE: The standard monthly rental rate is $1975 per month.